Have you reached that place and time in your life when you have done all the things you were supposed to do? The kids are grown and out of the house, you have a successful profession but it’s time to retire and you are ready to look at that next stage of your life. You just haven’t figured out what that is going to be. Travel, play with grandbabies, volunteer work or write a book? It all sounds nice, but it doesn’t make your soul sing! You know there is more to your life. You are not ready to sit on the backburner and stew! It’s time to REINVENT You! Dream BIG! REINVENT- Rediscover your Passion; Refuel your Purpose, Reset your Life will show you how to create you as you’ve always wanted to be. Elizabeth’s fresh perspective on life in the “senior lane” will show you how to take charge of your life and create choices that will make you happy. You will see the power of her unique process, the blending of how our four body systems work and how they impact our behavior and choices, as it leads you to take action to create the life you want. If you want to experience life at your full potential but you are hesitant because making a change is scary, consider this: what’s even scarier is the regret of not having done it. 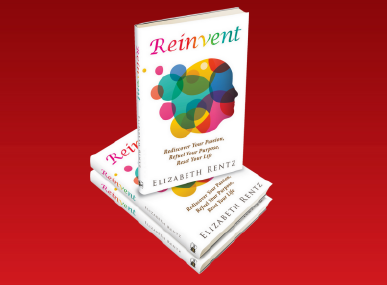 You owe it to yourself to read Elizabeth’s fresh, yet impactful perspective that is life changing.